I think the staff of Generation Prog Records (GPR) has a fine nose for good music. 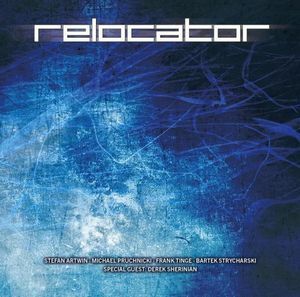 Although the album of the German based band Relocator was originally released in 2009, they took over the distribution of the band's eponymous album. For that reason it will now be easier to buy this album. Relocator consist of guitarist Stefan Artwin, bassist Michael Pruchnicki, the Dutch drummer Frank Tinge and electric violinist Bartek Strycharski. In a way Relocator didn't really function as a band, so all members decided to transform the band into a project, since a band needs more attention to maintain. The music on this debut album is a blend of instrumental prog rock and jazz-rock played with virtuoso musicianship. At the time, I was quite happy with this album but I couldn't get it anywhere. On my review of the GPR release Keystone by Alessandro Bertoni (2013, see review), I often mentioned Derek Sherinian, my favourite keyboardist. Well, guess who's responsible for the keyboard parts on this album? Indeed, Mr. Sherinian himself! All of the compositions have been written by Stefan Artwin, some of them together with Michael Pruchnicki. The music tends towards a heavy progressive style as far as the guitar and the bass are concerned. Listen for instance to Urban Blue and the powerful Biosphere to enjoy heavy melodic compositions. Since they have a violinist in the band, it's easy to compare them to other bands. Bartek Strycharski's style of playing can be regarded to be a blend of Jean Luc Ponty and Jerry Goodman − during the time he played with the Dixie Dregs − and some parts even sound like Robby Steinhardt (Kansas). Listen to Red Vibes and you'll get my drift. Guest musician Derek Sherinian provides the band's music something special, blending his own distinguished style with the band's style thus creating a strong and solid sound. For me one of the finest compositions is the over ten-minute oriental sounding piece Aavishkar, which shows the unique combination of Sherinian and Relocator. Aavishkar strongly reminds me of Gamalon, another impressive instrumental band that no longer exists, I guess. During this piece many duels can be enjoyed between various instruments with a tremendous sound. Another fine composition is The Alchemist. It combines strong heavy parts with softer acoustic passages that highlight Sherinian again, but also the virtuoso musicianship of guitarist Stefan Artwin.